Dropbox provides an easy way to share files across devices via the Cloud, and the iPad app is particularly useful because of the dearth of external ports on the device. But the app could use some more sophisticated file management tools. One of the frustrations of using the Apple iPad is that there is no conventional file system on it. What's more, there's no SD card slot or USB port to connect some sort of external storage, making it difficult to get files from one device to another without connecting the iPad directly to a PC or Mac. 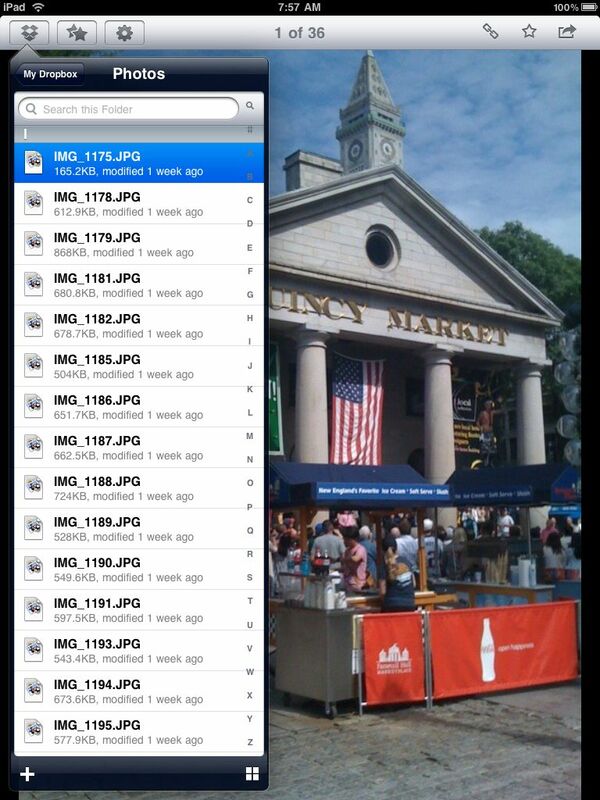 I decided to look at Dropbox, a tool that provides a way to share files on the iPad (and elsewhere) via the Cloud. Although the app lets you share files across many devices, this review is going to concentrate on how you deal with moving the files from your PC or Mac to the Cloud, then how you manage with those files on the iPad inside the Dropbox iPad App. Dropbox provides an easy way to get files onto the iPad, although the file management in the current app could use some work. Dropbox gives you 2 GB of Cloud file storage for free, after which you pay an additional fee--$9.99 for 50 GB or $19.99 for 100 GB. If your main goal is to use Dropbox to share files between your PC/Mac and your iPad, then the free service level should suffice. You start by installing the Dropbox app on your PC/Mac and simply adding files to it. Dropbox becomes a drive on your system, so you can move or copy files into Dropbox just as you would any drive. When you do this, the files sync automatically with the Cloud and show up in Dropbox on the web, and on any device where you have Dropbox installed, providing a handy way to get files to your iPad (or anywhere else for that matter). I decided to try this by moving a dozen photos and several different file types from my Mac Book Pro into my Dropbox folder. I installed Dropbox on my iPad, opened it and found my files were there right away. I was able to move a photo into the Photo viewing app on the iPad, but I could only move one file at a time, meaning I would open a picture (which takes a few moments to process), then click the Open with App icon and move it to the iPad. It worked well enough as far as it went, but it really would have been nice if I could have chosen multiple files to move. The iPad App also had file management limitations, not allowing me to rename or delete files in the App, something I can do easily on the Mac or web site. That means to manage the files, I have to do it somewhere else. 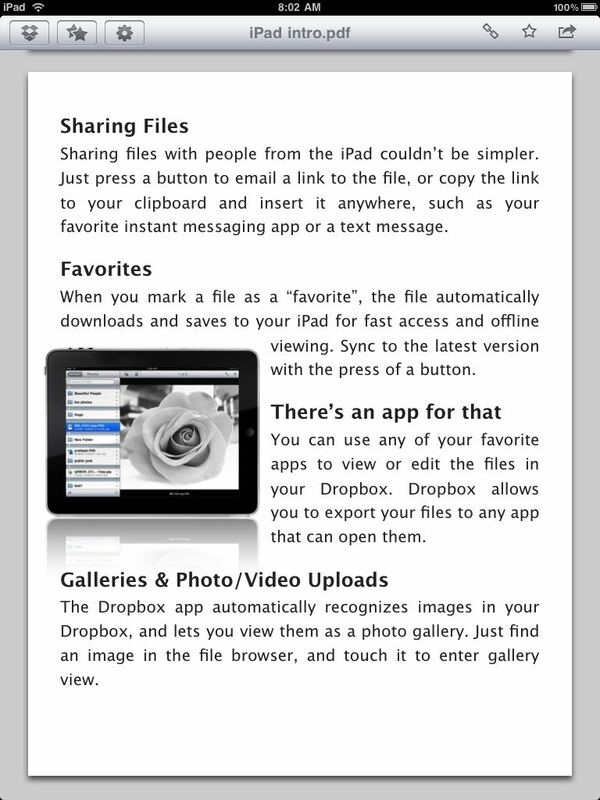 You can preview rtf, txt and pdf file inside of Dropbox without having to explicitly open a second app to achieve this. It's worth noting that I couldn't preview a Word 2003 document inside Dropbox, which requires a third-party file viewer or word processor that reads Microsoft Word file formats. Finally, you can move photos or files from the iPad into Dropbox to share on other devices as I did with this photo below. Overall, Dropbox provides an extremely convenient way to move files between your machine and your iPad, and especially to get photos from your PC or Mac onto the iPad or vice versa, but don't expect too much here. It's a pretty bare bones tool. Dropbox is an excellent service, even if the iPad app could use a bit more oomph to take it to the next level. It says 7 out of 10? Yup, Davey went in and fixed it for me after it published. When I published it read No Rating, hence my comment. Selection, file storage, sharing and synchronization service, now available for the updated iPad.With installed Dropbox, IPAD users can access all your files and folders stored without having to sync files through iTunes First, as is necessary with Apple's own iWork suite of office applications. The files can be viewed on Dropbox or open itself to third-party software. I like Dropbox but due to several security issues the past couple of months (using plaintext passwords, turning off password requirements for the entire site for hours at a time) I have decided to move to Box.Net. It works well from ipad and iphone as well as mac and windows pc, and i can stream mp3's from Box.Net to my devices.